MD and I always talk about Indian food but for some reason, we always pass over the idea when brainstorming dinner options. Finally, we filled this void in our repertoire and satisfied our Indian craving last Saturday with a visit to Aanchal. 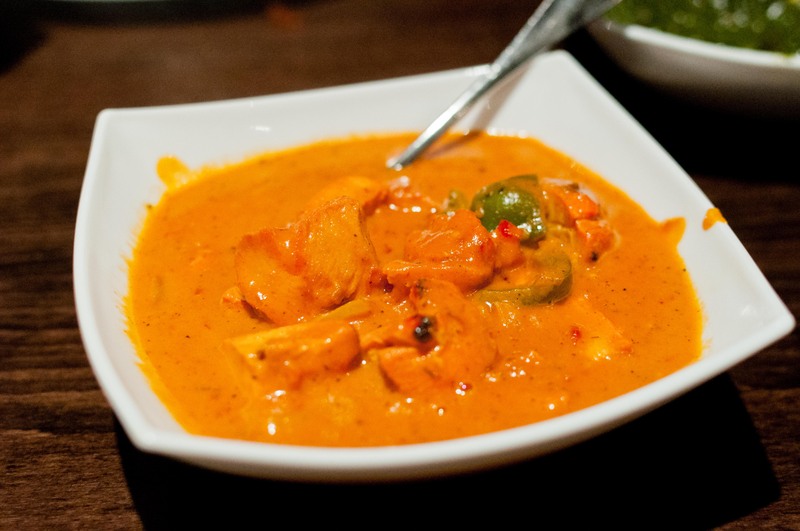 The idea of spicy comforting Indian food felt just right on the cold and snowy night. With the 7 train still out of commission on the weekends, we were very glad that Long Island City had its own little Indian spot right off of Court Square. It was already half past 8 when we ducked into Aanchal and we were hungry. To keep my hunger at bay, I immediately ordered a mango lassi. 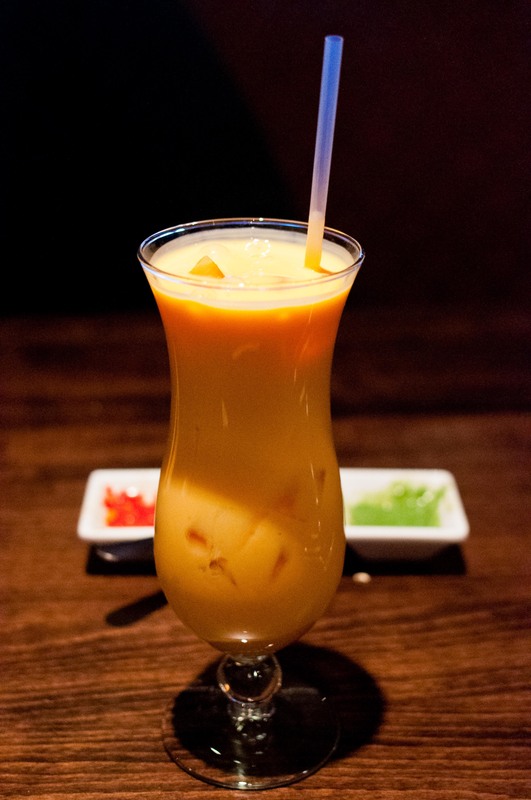 The tall glass was perfectly smooth and creamy with a hint of sweetness from the mango. Even though I knew I should have probably saved it to cool down the spicy dishes later, I couldn’t help but finish the entire glass before appetizers arrived. There was really little debate as to what we were going to order for dinner. I love my wings so the Bombay wing appetizer was the clear choice. 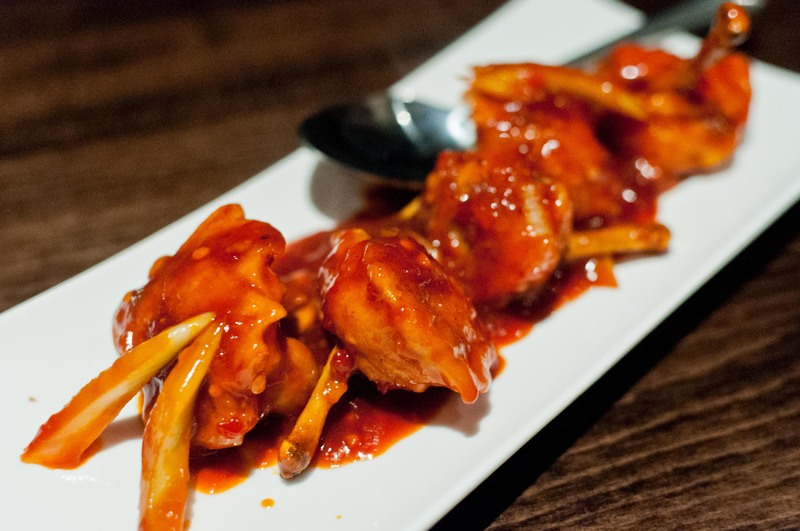 These were more like lollipops than regular wings with a little nub to grab onto. The meat was perfectly fried and tossed in a spicy and sweet chili sauce. I could tell that these were freshly fried with the first bite and needless to say, they were gone in a matter of minutes. For entrees, we kept it pretty simple with an order each of the creamy chicken tikka masala and a smooth palaak paneer. 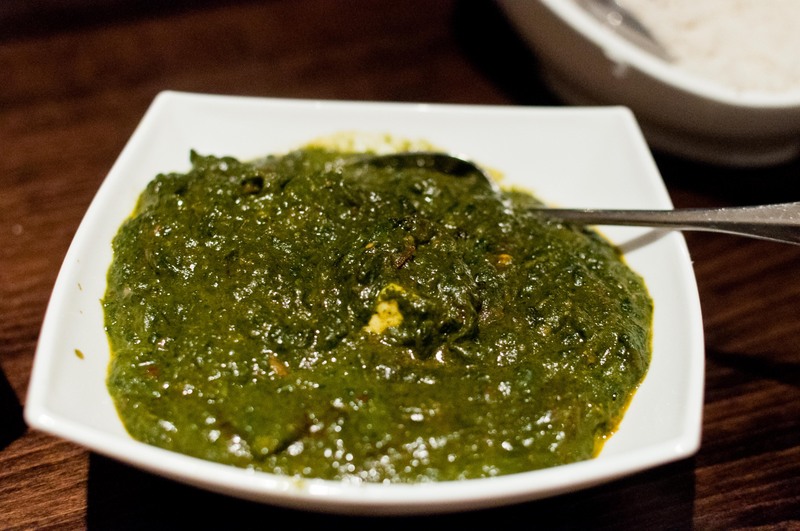 Even though I don’t particularly like the paneer itself, I do love creamed spinach and the palaak paneer tastes that much healthier than your typical steakhouse variety. And of course, we had to order the goat curry to satisfy my craving for the gamey meat. 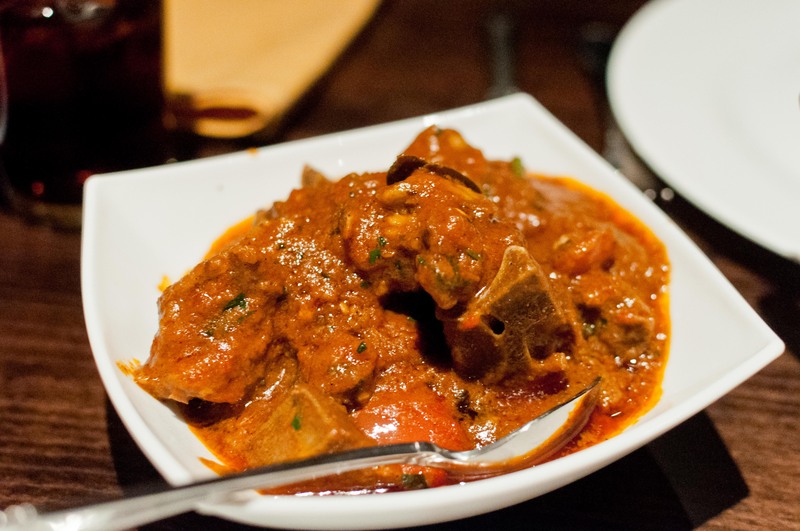 I happily piled my plate high with the spicy tomato based curry and tender goat pieces, both on and off the bones. There is just something about the goat and curry spices that pair so well together. Despite the fact that we had asked for all three dishes to be spicy, we suspect that the kitchen held back on the heat. They clearly didn’t know who they were serving that night. Aanchal served rice with the dishes but we have had naan on our mind ever since we decided to have Indian for dinner. I voted for the garlic naan while MD chose the kashmiri naan, stuffed with a dried fruit paste. 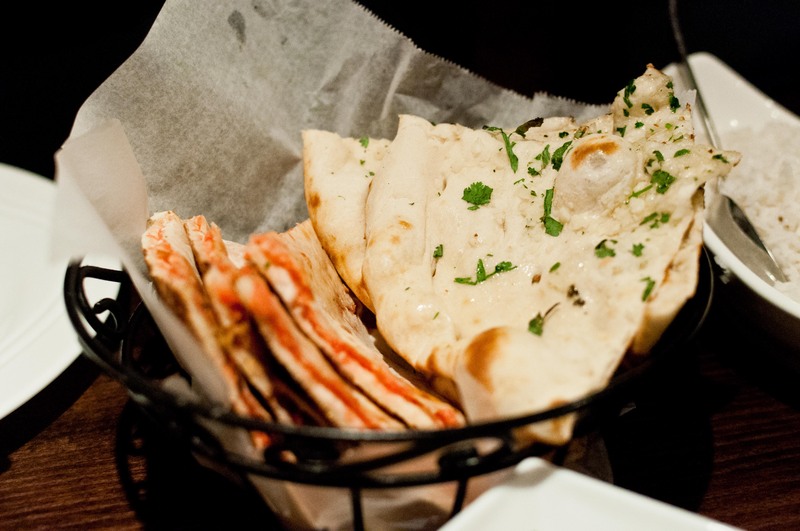 Even though I had my hesitation with the kashmiri naan, I had to admit that the subtly sweet naan paired very well with our spicy entrees. And the bonus? They were sweet enough to stand in for dessert too. But of course, neither MD nor I can pass up rice pudding so there was no point in trying to fool ourselves with the kashmiri naan for dessert, as good as they were. 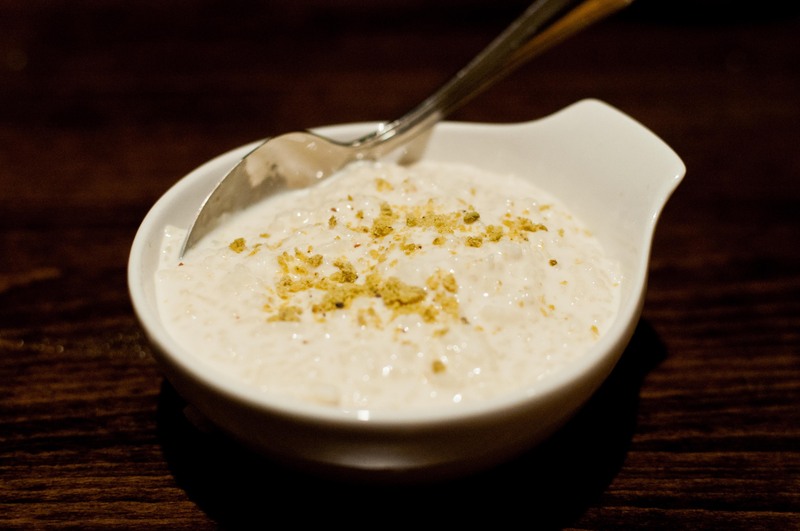 The Indian style rice pudding at Aanchal was served chilled, with a scattering of pistachio on top. It was creamy yet light, with a good balance of spices – just what we needed to end the meal. By the time we left, the restaurant had filled up with patrons, all happily dining on some belly warming food. We were both glad that we finally stopped by Aanchal after talking about Indian food for so long. It’s reassuring to know that we don’t have to venture far to satisfy our cravings for naan and curries. We will just have to remember to ask for extra extra spicy next time.